The Socialist Party of Great Britain does not support the Labour Party or Labour Governments. The S.P.G.B was founded in 1904 by working men and women who were convinced that Socialism is the only hope of the working class. Labour Governments cannot solve the workers’ problems. In 1924 and again in 1929 we placed on record in our official organ, the “Socialist Standard,” our certainty that the Labour Government just entering office was bound to fail, not because it was a minority government but because the whole idea of Labour Government is based on a wrong principle. We saw those two governments come to an inglorious end, as we knew they must, but the lesson was not taken to heart by the workers. This time there can be no good reason for failing to draw the correct conclusion. The Labour Government which entered office in 1945 cannot solve the problems facing the workers of this country. No matter how able and sincere the M. P.’s and members of the Labour Party may be they cannot succeed in making the existing social system work in the interest of the great majority of the population, the wage and salary earners. To say this is not, however, a gospel of despair. The workers’ problems can be solved, but only by abolishing the capitalist system of society at one sweep and establishing Socialism in its place. This great task can be brought to fulfilment, but first it is necessary to understand why “Labourism” is not and cannot be the means of doing it. It is the purpose of this pamphlet to explain why “Labourism” must fail and why Socialism will succeed. CHAPTER I – WHY SOCIALISM? There is a great deal of confusion in the way the word Socialism is used by different people and parties, and this confusion has to be cleared from our minds before we can usefully consider by what means Socialism can be achieved. It is not sufficient to know that a political party bears the name socialist or proclaims Socialism as its aim; we must also find out what it means by Socialism. Long ago a British politician declared, “We are all Socialists now,” but all he meant was that the Conservative and Liberal Parties had been compelled to accept more and more the intervention of Government in affairs that were formerly left to private companies and individuals. He did not mean that they were intending to introduce Socialism. The same contrast exists between the aim of the British Labour Party and the aim of the S.P.G.B. Labour spokesmen, such as Mr. Herbert Morrison, declare that Public Utility organisations like the London Transport Board are examples of “Socialisation”; while the S.P.G.B opposes organisations of that kind on the ground that they are State Capitalism and not at all the kind of thing Socialists are seeking to achieve. To answer that question we can conveniently start by pointing out one thing about which the Labour Party and the Socialist Party are agreed; both realise that capitalism as we have known it is defective and both want change. There, however, the agreement ends. The Labour Party proposes certain changes which it believes will bring about a great improvement in the conditions under which the mass of the population live and work. The Socialist Party, on the contrary, holds that these changes will make no appreciable difference. The Labour Party seeks to “nationalise” the principal industries while the Socialist Party holds that “nationalisation” will not alter capitalism fundamentally and will leave untouched and deep-seated evils of poverty, unemployment, industrial unrest and war. The existing social system is universally known by the name “Capitalism.” It is called by this name because the means of production and distribution, the land, factories, railways, etc., are owned by capitalists, that is, by people possessing large amounts of money that they have invested so as to acquire ownership of these means of production and distribution. They may be landlords with their money invested in land and buildings, and draw their income from investment in the form of rent. They may be owners of factories or trading concerns, or they may have shares in a large number of companies and receive their income in the form of profits. Lastly, they may have invested their money by making loans to manufacturing or trading capitalists, or by lending it to the Government, or Municipalities. They then receive their income as “interest” on loan. All three groups are alike in that they live by receiving income from their investments, a property income. The great majority of the population do not own sufficient money to be able to live on the income received by investing it. They are wage and salary earners. They live by being employed; by selling their mental and physical energies. They are the working class. The working class, by applying their energies to nature-given material, produce all of the necessities and luxuries which the whole of the population consume, but as employees they receive a wage or salary which provides them only with the means of subsistence required for their maintenance and that of their families. The workers, in, say, three days work a week, produce an amount equal to what they receive as wages; the rest of the week their work produces a “surplus value” out of which are derived the rent, interest and profit of the propertied class. Here is the root cause of working class poverty. The workers are carrying the propertied class on their backs, the workers are an exploited class. Exploitation will cease and poverty disappear only when the means of production and distribution cease to be owned by a small class of capitalists and become the common property of society as a whole. Property incomes will be abolished. At the same time the amount of wealth produced will be vastly increased because wealthy idlers will become useful citizens helping in the work of production, and because all kinds of financial and other activities necessary under capitalism but unnecessary under Socialism will cease. The workers released from such activities will be available for productive work. Other evils of capitalism will also disappear, among them unemployment, economic crises and war. This trinity of evils results from the fact that under capitalism articles are not produced solely because they are useful but with the object of making profit for the capitalists. Unemployment arises because the capitalist closes down, or restricts production to the amount he believes he can sell at a profit. Economic crises occur because mass production by rival capitalists periodically throws on the market huge quantities of goods that cannot be sold at a profit. Wars are the result of the struggle by the capitalists of different countries to capture profitable markets, areas rich in natural resources, or to control trade routes and points that are strategically important. Under Socialism there will not be two classes – a capitalist class which owns but does not produce and a working class which produces but does not own – but a classless society in which all able-bodied men and women will co-operate in the production of wealth and will freely have access to the articles produced. This is fundamentally different from capitalism. Socialists advocate it because it is the only way of fully utilising for the benefit of all the gigantic powers of production that have been made possible since the rise of capitalist mass production. Capitalism is now an outmoded system, the continuance of which will perpetuate great economic evils that are now unnecessary and will bring great perils from the latest developments of the weapons of destruction. The question that needs to be put to all political parties is therefore whether or not they stand for the immediate abolition of Capitalism and institution of Socialism. If they do not, then they are standing in the way of social advance, even though, without any justification, they choose to call their policies Socialism. For a concise statement of the aims and methods of Socialism the reader should turn to our Declaration of Principles printed on the inside of the cover of this pamphlet. If there is confusion about the term Socialism there is an equal confusion about the aims of the Labour Party, due in addition to the way in which individual members put their own interpretation on the immediate and ultimate purpose of their Party. To some extent too, the Labour Party changes its programme from time to time. “The Labour Party is a Socialist Party and proud of it. Its ultimate purpose at home is the establishment of the Socialist Commonwealth of Great Britain – free, democratic, efficient, progressive, public-spirited, its material resources organised in the service of the British people.” (Our italics) (p.6). We will examine later whether the programme of that the Labour Government seeks to carry out in any way justifies the name Socialism and whether this will, as is claimed, bring us nearer to Socialism. At this stage it is only necessary to say that Socialism is the pressing need of the moment, not something to be relegated to the distant future as an “ultimate” objective. Even the most shortsighted political observer, engrossed in the problems of the moment, should realise that with the advent of atom bombs and other weapons of total war, the human race tarries on the brink of destruction. Socialism cannot be postponed with safety. It is only in recent years that the Labour Party has made the claim that it is a Socialist Party, and even now this claim nowhere appears in the Party’s Constitution and Objects. Indeed, though the Party was formed in 1900 under the name “Labour Representation Committee” (changed to Labour Party in 1906) it was admitted by the Secretary of the Party in 1918, the late Arthur Henderson, that until that year they were not a political party at all: “they had never in the proper sense claimed to be a national political party.” (Labour Party Conference Report 1918, p.99). Before 1918 the Labour Party had no programme in its Constitution and its only permanent object was the formation of a Labour Group in the House of Commons. The year-by-year policy of the Party was determined by resolutions on particular questions passed by Annual Conference. As a former Labour M. P., Mr. S. F. Markham puts it: “Up to 1918 the Labour Party had deliberately and repeatedly refused to adopt a formal programme because it did not want to exclude Non-Socialists, but in that year the official declaration of the policy of the party as contained in ‘Labour in the New Social Order’ definitely committed the party to Socialism without ever actually using the word.” (“History of Socialism,” Published in 1930 by A. & C. Black, p.216). To understand how a political party could reach the curious position of claiming to want Socialism but at the same time excluding the word Socialism and seeking Non-Socialist members, it is necessary to recall how and why the Labour Party was formed. “The Labour Party was largely created by the indignation of the of Trade Unionists at the Taff Vale judgement (1900), which deprived Trade Unions of the immunity they had held for a generation from actions for damages by employers injured by strikes. This decision placed the funds of the Trade Unions at the mercy of employers and virtually made large-scale strikes too dangerous to be practicable. The Labour Movement was united in demanding its reversal by Parliament, and this was the first plank in the Labour Party platform.” (“Kirkup’s History of Socialism,” revised and re-written by E. R. Pease, Published by A. & C. Black, 1920, p.389). Both in its aim and in its form of organisation (that of a federation of affiliated trade unions) the Labour Party was at its foundation merely an instrument in the hands of the trade union officials and executive committees for dealing in Parliament with matters that affected the trade unions and their members. In 1918 an effort was made to broaden the basis of the Party by admitting individual members as well, and it is through this door that men and women who are not trade union officials have in increasing numbers obtained office in the Labour Party or have become Labour M. P.’s; but the change of organisation has had little effect on the Labour Party rank and file membership as a whole. The latest figures, given in the Report of the Labour Party Conference 1944, show that while individual members number 235,501, and the members of affiliated political parties and co-operative societies number 30,432, the affiliated trade unions with 2,237,307 members account for nearly 90% of the total membership. A glance at the composition of the Labour Parliamentary Party in the House of Commons brings out this point. While the largest single group among the Labour M. P.’s is still trade union M. P.’s, “an analysis…shows the Labour Party to be by no means representative of only a narrow section of the population….” (Manchester Guardian 31st July 1945). There are about 80 lawyers in the present House of Commons of whom “slightly more than half…are Labour members…” Among the other Labour M. P.’s are “between 20 and 30 business men, and a good sprinkling of farmers, accountants, consulting engineers and other professions.” (Manchester Guardian 31st July 1945). A final reference to this changed composition of the Parliamentary Labour Party is the statement in the House of Commons made by Mr. Arthur Greenwood, the Labour Lord Privy Seal. He said: “I look around among my colleagues, and I see landlords, capitalists and lawyers. We are a cross-section of the national life, and this is something that has never happened before.” (Hansard , 17th August 1945, col. 261). Before dealing, in the next section, with the Labour Government’s claim to be achieving Socialism, we may summarise what is said above about the changed aims and composition of the Labour Party. At the outset it was a body formed primarily to secure amendment of the law as it affected trade unions. It had not, and did not claim to have, Socialism as its objective (even nationalisation which, in Labour circles, is wrongly described as Socialism). Through the broadening of its base its M. P.’s now include lawyers, business men and landlords, and others not officially connected with the trade union movement; and it has found a programme which, by promising various reforms and immediate action on housing and other problems, has proved sufficiently attractive to the electors to reduce the Conservatives to the position of a not very large minority in the House of Commons. The Labour Party has found that it is now popular to proclaim “Socialism” as an ultimate objective. Yet the thoughtful working class supporter of the Labour Party may well ask himself what is the significance of the change that has taken place. In ceasing to be a “class” party (in the sense of being primarily concerned with trade union problems) the broadened Labour Party has become an even worse instrument when judged from the standpoint of the interests of the workers and the standpoint that Socialism is the urgent present need of the human race. It has merely taken the place of the Liberals as the party to run capitalism when the Tories are out of office. Some of the individuals who helped to built the Labour Party in its early years did so with a purpose very different from that of the trade union officials who were only concerned with safeguarding the trade unions. They were not even concerned overmuch with the idea of obtaining social reforms such as old age pensions, workmen’s compensation acts, unemployment insurance and the other reforms which have been the subject matter of resolutions passed at Labour Party Conferences and of the election addresses of Labour Party candidates. Their idea was that a Labour Party formed for very limited objects would gradually be converted to Socialism and would ultimately become a Socialist Party, willing and able to bring about Socialism. In putting forward this policy the individuals in question were rejecting the very different case put forward by the founders of the Socialist Party of Great Britain. The founder members of the S.P.G.B., who had themselves had had the experience of the failure of earlier organisations which tried to combine a Socialist objective with the task of fighting for day to day reforms of capitalism, saw clearly that an effective instrument for Socialism can only be built up on a foundation of convinced and understanding Socialists. An organisation that devotes its energies to struggling for reforms of capitalism naturally gathers around itself the men and women interested in those reforms and it cannot do other than accept them to membership. It cannot at one and the same time advocate reforms of capitalism and insist that its membership shall be confined to Socialists. The reformists dominate the organisation by force of numbers and any small group which professes to believe that Socialism is indeed the only hope of the workers has to bow to the non-Socialist majority and draw what satisfaction it can from the pious declaration that Socialism is the Labour Party’s objective, not now but ultimately. What is even worse, the term Socialism has been corrupted by being applied by the Labour Party to the institutions of capitalism, with the result of making it harder for Socialists to explain what Socialism really is and how it must be brought about. Capitalism continues but the Labour Party calls it Socialism. From the beginning the S.P.G.B appreciated that it would be slow work to convince a majority of the working class that they can emancipate themselves only by becoming Socialists, organising in a Socialist political party and using the vote to gain control democratically of the machinery of government for the purpose of dispossessing the capitalist class and making the means of production and distribution the common property of society. It has been hard, uphill work, but it makes headway. Even with our limited resources we have been able to build up a firmly based and steadily growing Socialist Party with companion parties in Canada, U. S. A., Australia and New Zealand. One answer to Labour Party critics who profess to see in our slow growth the proof that our case was wrong, is that if all these years of work devoted to organising the Labour Party and carrying on propaganda work for social reforms, had instead been devoted to the task of making Socialists, the genuine Socialist Party would not now be the small organisation that it is, but would be vastly larger and stronger. Labour Party propaganda has not helped the Socialist movement. True it has gained an electoral majority for the Labour Government, but only at the cost of remaining silent about the real problem, that of abolishing capitalism and instituting Socialism. Labour Party propaganda over the years has got further away from the real issue. Some of the professed Socialists, who years thought they could use the Labour Party as an instrument for Socialism knew that there could be no Socialism without dispossessing the capitalists and abolishing the capitalist system. They did not cherish the illusion that Socialism could exist while the capitalist class are still in possession, nor did they believe in the now familiar Labour Party doctrine that Socialism is gradually being built up inside capitalism. 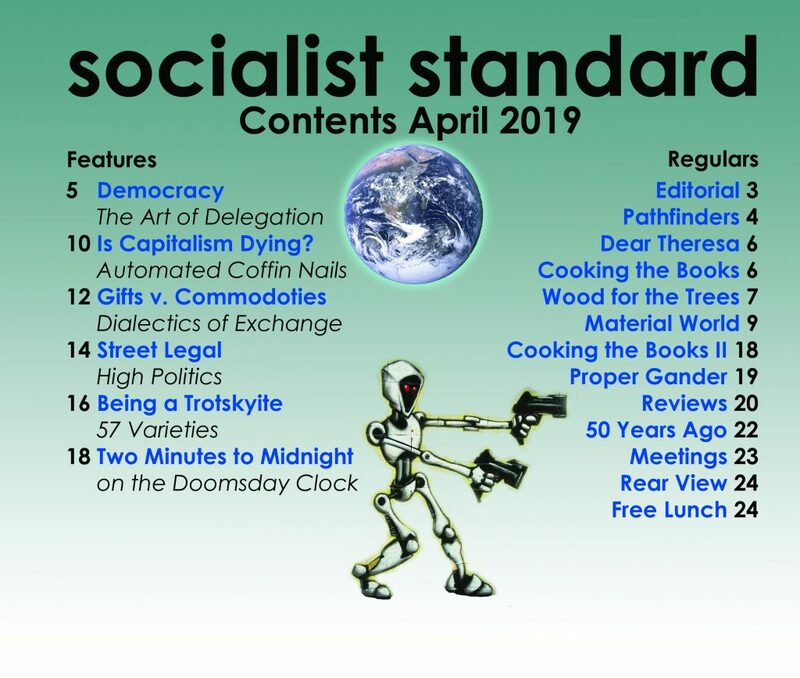 They would have laughed at the statement made by Mr. J. R. MacDonald when he was the chosen and popular leader of the Labour Party, that “The Socialist State is already appearing within the capitalist state.” (“Socialism: Critical and Constructive.” Pocket edition, p.308. Published by Cassell & Co., 1924). How far the Labour Party has run away from the clearer conceptions of some of its founders can be seen by comparing a manifesto issued in 1893 (by men several of whom were later prominent in the Labour Party), with the propaganda and programme now put out by the Labour Party. “On this point all Socialists agree. Our aim, one and all, is to obtain for the whole community complete ownership and control of the means of transport, the means of manufacture, the mines and the land. Thus we look to put an end for ever to the wage-system, to sweep away all distinctions of class, and eventually to establish national and international communism on a sound basis.” (Manifesto of English Socialists, May 1893). 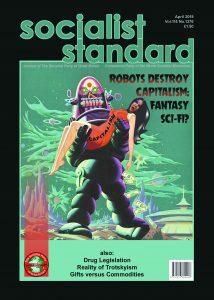 If they were prepared to advance schemes of “nationalisation” or State capitalism it was not an end in itself but because they held (though mistakenly) that the control of capitalist industry by the capitalist State would more quickly make it possible to dispossess the capitalist class and introduce Socialism. As another of the Labour Party pioneers, the late Keir Hardie phrased it, “State Socialism” (by which he meant State capitalism) “with all its drawbacks, and these I frankly admit, will prepare the way for free Communism in which the rule… of life will be – From each according to his ability, to each according to his needs.” (“From Serfdom to Socialism.” Published by George Allen, 1907, p.89). Now after all these years of Labour Party propaganda and the rise of that Party from obscurity to its present position of being a Majority Government, what was to have been a means has become an end in itself. Labour Party election propaganda at the General Election in 1945 was largely concerned with assuring the capitalists as a whole that it is in their interests that certain industries and the Bank of England should be taken over or closely controlled by the State. No longer is there any talk about the dispossession of the capitalists but instead the official assurance repeatedly emphasised that State control of various industries will be “on a basis of fair compensation.” (“Let us Face the Future,” Labour Party, 1945, p.7). Under the Labour Government’s Bill to nationalise the Bank of England the stockholders are to go on receiving the 12% dividend they have enjoyed for the past twenty years. Those who deride the S.P.G.B. for “impossibilism” and believed the growth of a Labour Party would lead to increasing acceptance of Socialist principles have indeed been correct about the growth in Labour Party membership but Socialist principles have been not merely excluded but forgotten. Since the erroneous ideas about nationalisation are so widespread and Labour supporters believe that nationalisation is Socialism, the next section deals with this question more fully. Leaders of the Labour Party in the Government are putting over a monstrous deception on the workers in the mining and other industries. If Conservatives were now in power they would be telling the workers that it is necessary for them to work harder in order to replace what has been destroyed by war and to produce articles needed owing to the present scarcity of coal, clothing, food, etc. After the last war the same tale was told – and in due course the workers reaped the harvest of increased production in the shape of wage cuts, glutted markets, and long queues for unemployment doles. Remembering what happened then many workers would now be sceptical about such propaganda, if it came from the Conservatives. They would suspect that they were again being tricked into sacrificing themselves for the benefit of capitalism and the profits of the capitalist class. Now the propaganda campaign is in full swing again, but this time it comes from the Labour Government and it is baited with the pretence that under Nationalisation greater production will benefit the whole community and not the propertied class. It is the Labour Government now that tells the workers to tighten their belts! “Partly owing to the war, there is a severe physical shortage of all the goods required to provide an abundant life, and if that abundant life is to be assured in the future certain immediate privations will have to be endured in order to restock the capital industries. No Tory Government could make this appeal, for the worker would suspect that the summons to hard work, discipline and abstinence would result only in fortunes for the few and the later wastage of unemployment. The new Government is in a different situation. It must appeal for hard work, discipline and, for a short period, continued abstinence. All these are needed to increase the total wealth for distribution. But a Labour Government at the same time can give concrete proof of its resolve to use this wealth for the benefit of the whole community. By its social insurance and health and housing plans it can show its determination to secure a greater equality in the distribution of wealth. By its nationalisation proposals it can show its resolve that the re-equipment of industry shall not merely bring greater profits to the few. By its financial measures it can prove that, when this period of shortage is over, no return will be allowed to wasteful unemployment.” (Daily Herald , August 7th, 1945). Mr. Foot was answering criticisms made in the Economist (August 4th), that if the owners of a nationalised industry receive as compensation the same income that they were drawing already there is no surplus from which the workers could receive higher wages unless (through more machinery, greater efficiency and harder work), the productivity of the industry is increased. Mr. Foot’s answer is that the Labour Government will get this greater productivity but it will benefit the workers and “not merely bring greater profits to the few.” (Our italics). The Labour Government having in the words of the Daily Herald convinced the electorate “of its detachment from class interests” (i.e., working class interests), and “of its devotion to the welfare of the whole community” (Daily Herald , August 1st, 1945), no longer adheres to its old propaganda in favour of drastically redistributing the national income in order to help the workers. “If we were to be able to provide better benefits under the social insurance measures, reduce taxation, and provide more of the goods of life for everybody, the only way was by increasing the total national income…it could only be done by work, thought, drive and initiative.” (Time , September 6th, 1945). “Asked the workers in the pits to adopt the new attitude….Hitherto the policy of the Union had been to get what they could out of the owners. Now they had taken on the responsibility of assisting in running the industry they must accept new methods. They must take a more active part in assisting greater technical efficiency and increasing output.” (Daily Telegraph, September 7th, 1945). This new emphasis on the capitalist doctrine that the workers can only get more contrasts glaringly with what the Labour Party and the Communists were saying just before the war. Compare Mr. Morrison’s statement now with what the Labour Party was saying only a few years ago in its pamphlet, “The Nation’s Wealth at the Nation’s Service,” by Mr. Douglas Jay. (Published by the Labour Party, 1938). Another indication of the Labour Party’s change of front is their present complete silence on the “capital levy.” Yet after the last war this device, which was offered as a means of transferring wealth from the capitalists to workers, occupied first place in the Labour Party programme. So much for the Labour Party since it has progressed from the pre-war political wilderness to the milk and honey of office. Nationalisation is no solution for the poverty problem of the working class though it may indeed, as the Labour Party claims that it will, help capitalist industry to improve its efficiency, cheapen its goods and be better able to face the fierce rivalry of American and other producers in the world market. Nationalisation leaves the working class still an exploited class producing surplus value for the capitalists. It removes the capitalists from direct control over the administration of nationalised industry but leaves them still in possession of their wealth though this now takes the form either of a lump sum compensation which they can invest elsewhere or of Government Bonds on which they draw interest. From the standpoint of working class interests, nothing of importance is changed. Not nationalisation, which is just another name for State Capitalism, but Socialism which involves the abolition of capitalism, is the objective for which the working class must strive. The Labour Party is the party of State Capitalism. It is not a party serving the interest of the working class. With its campaign for harder work and increased production it is trying to demonstrate that it can run capitalism more efficiently than the Tories have managed to do. The fallacy underlying the idea of Labour Government is the belief that capitalism can be administered by a Labour Party in a manner different from that which Conservatives and Liberals administer it. Labour supporters forget or do not know that capitalism is a “class” system, based on the ownership of the means of production and distribution by one class, and the exploitation of them of the other class, the workers. It is impossible to serve two masters, the capitalist class and the working class, and since the function of every Government under capitalism must be to make the system work as smoothly as possible, the day a Labour Government takes over it accepts the responsibility for maintaining the exploitation of the working class. It must enforce the law protecting capitalist property. It must take action to coerce the workers if by widespread strikes they endanger the position of the capitalists. Labour supporters fondly believe that a Labour Government can introduce improvements in the wages and conditions of the workers and thus earn their increasing approval for Labour administration of capitalism. Experience of Labour Governments in this and other countries shows that capitalism cannot be made satisfactory to the workers. The workers are exploited to produce rent, interest and profit for the propertied class and even without fully realising the nature of this exploitation the working class under capitalism are generally discontented and more or less hostile to their employers over wages and conditions of work. Under Conservative administration of capitalism this discontent naturally embraces not only the employers but also the Government that supports the employers. Under Labour Government likewise no other result is possible. In October, 1945, the British Labour Government was faced with a similar situation. The dockers in London and other ports had suffered a big reduction of earnings on the sudden ending of special war-time agreements, and claimed an increase in their basic rates. The strike was “unofficial,” not having the backing of the Unions concerned, but the men considered that their interests were best served by striking without delay and they remained out despite the appeals of Union officials and Ministers in the Labour Government. “take duty in aid of the civil power in connection with a trade dispute, or to perform, in consequence of a trade dispute, any civil or industrial duty customarily performed by a civilian in the course of his employment.” (Hansard, 12th May, 1939, col. 889). “The right to strike, although it is only resorted to in a moment of extremity, is a right which the trade union movement is anxious to safeguard, and in such a contingency we should resent very strongly the use of conscripts who might be employed…either to assist in suppressing the men who were on strike and bringing the dispute to an end, or to take their places, in any particular department of industry.” (Hansard, 12th May, 1939, col. 889). So the Labour leaders who denounced the Tories for being prepared to use troops in office for more than a few months before they were doing the same themselves. It is sometimes said that if the workers’ wage demands are “reasonable” a Labour Government would force the employers to give way; and if the workers’ demands are not “reasonable” it is only right that the Government should resist the workers. But what is “reasonable”? Since all property-income, rent, interest and profit, is derived from unpaid labour or surplus value extracted from the workers, then the demand for complete wiping out of rent, interest and profit is very reasonable from the workers’ standpoint. How can a Labour Government which professes to aim at Socialism deny the reasonableness of the demand? Yet on the other hand, committed to running the capitalist system efficiently, the Labour Government must keep the capitalists in business, and has explicitly recognised this by its declaration that the employers must have a “reasonable return on the capital employed.” (Sir Stafford Cripps, Daily Herald, 13th August 1945). There is no way out of this conflict except by abolishing the capitalist system, a step for which the Labour Government sought no mandate at the election. The only course that is practicable for a Labour Government is to keep capitalism going and this, inevitably, means coming into conflict with the workers, whose discontent with the effects of capitalism no Labour Government can satisfy. The tenure of the Labour Government will, like the earlier Governments, be a history of working class dissatisfaction and disillusionment, ending in due course with the loss of votes and seats at a General Election, or, as in 1931, with the formation of a coalition Government to meet some new world economic crisis, or crisis in relationship with rival capitalist powers. Let it not be thought that a Labour Government with different leaders could do any better. Labour Governments in other countries have met just the same insoluble problem. In Australia, both in the Federal Government and in the governments of the States which make up the Federation there have been many Labour Governments and always with the same result. In the Federal Government the first Labour Administration (a minority) took office in 1904 and the first Majority administration, in 1910. Although since 1904 there have been over a dozen General Elections, on only four occasions have the electors, though they had had experience of a Labour Government at work, returned Labour with a majority. Australian Labour had had its “MacDonald” affair just like the British party. In 1914 the Australian Labour Government had a small majority but in 1916, over the conscription issue, its leader, W. M. Hughes, broke with his Party and formed a National Government. He and his supporters were expelled from the Labour Party but at the election the Hughes Ministry “faced the electors on a war hysteria programme in May 1917, and was returned to power.” (Australian Labour Year Book, 1934-5, p.57. Published by the Labour Daily Ltd., Sydney). “…it took office under the leadership of Mr. Scullin against a hostile Senate. This ministry made a fatal mistake in lacking the courage to challenge the senate immediately on the main issues of its mandate, arbitration and the settlement of the coal and timber lockouts, and the wheat bounty, and force a double dissolution. As it was it drifted, through timidity and incompetence, into general disfavour, and finally accepted a dissolution to save itself from an inquiry into its administration of relief money. At that period it had ceased to be a Labour Government, except in name.” (p.58). The writer of the comment quoted above seems to think that a Labour Government trying to administer capitalism can be “Labour” in more than name, but neither he nor anyone else can explain how this impossible feat of serving capitalism and at the same time serving the workers is to be performed. All of the Australian States have had Labour Governments and at the time of writing (1945) there are Labour Governments in Tasmania, Queensland, West Australia and New South Wales, as well as a Federal Labour Government. Queensland, which used to be praised for the work of its Labour Government both by the Labour Party and the I. L. P. under such misleading titles as “Socialism in Queensland,” gives a typical example of the way in which the class struggle of capitalism brings to failure the efforts of Labour Parties to administer the system. In 1927 there was a Labour Government in Queensland and one of its responsibilities was running the Queensland State Railways. During a strike of sugar workers the railwaymen, in accordance with the idea of trade union solidarity, refused to handle consignments of sugar produced by “blackleg” labour. Instead of supporting the railwaymen the Labour Government “threatened to dismiss all the workers employed in the State Railways unless the men gave way.” (“Labour Research,” Labour Research Dept., Nov. 1927). The railwaymen were locked out and eventually forced to capitulate, each man having to sign an undertaking to obey the rules and regulations laid down by the Labour Government’s railway department. The sugar workers (one of whose strike pickets was murdered during the strike) were forced to go back to work on terms which, while ensuring the re-employment of strikers permitted the employers to retain some of the “blacklegs” they had recruited to break the strike. One of the natural results of the dispute was that many workers at the General Election in 1929 voted against the Labour Government. It was defeated, its M. P.’s being reduced in number from 43 to 29, and the opposition increased from 29 to 43. The only absurd thing about it is that workers should cherish the illusion that Labour administration of capitalism can ever be essentially different from Tory or Liberal administration. We have remarked on the fact that workers who have experienced Labour Government invariably turn against it in due course. In 1931 the British Labour Party lost nearly two million votes as compared with the 1929 election. Similar loss has repeatedly happened in Australia. In New Zealand there is at present a majority Labour Government elected in 1935 with 52 and re-elected again in 1938 with 54 seats. In September 1943, after eight years in office, another election took place at which Labour seats were reduced from 54 to 45, though this still gives a majority. The Labour vote at this election was actually less than the total vote of the National Party and Independents. One feature of capitalism against which Labour Governments are helpless is the periodical world economic crises which make no discrimination between the political complexion of the Governments in office. During the crisis in the nineteen-thirties, vast unemployment, in many countries exceeding 20%, struck at every country, including “Labour” governed Britain and Australia, and non-Labour U. S. A. There is no cure for economic crises except the abolition of capitalism. A Labour Government with an overwhelming majority in the House of Commons is undertaking the task of administering the capitalist social system in Greta Britain, pledged to solve outstanding working class problems (as well as try to increase exports and capture foreign markets for capitalist industry) but without having sought any mandate to abolish private ownership of the means of production and distribution. In practice it shows itself more and more a tool of capitalist industrial and trading interests. “There is a broadening field for State ownership and enterprise, especially in relation to monopolies of all kinds.” (Broadcast speech reported in the Manchester Guardian, 5th April 1943). “more Socialism” (meaning State capitalism) “was done by the Conservative Party which opposed it, than by the Labour Party, which was in favour of it.” (Times, Feb. 12th, 1944). These are problems of capitalism and their solution makes no difference to the wage-slave position of the working class or to the fundamentals of the capitalist profit-seeking system. The fact that there are also Labour Governments in Australia and New Zealand, and that further Labour Governments will come to power in the Scandinavian and Central European States makes no difference, all are compelled – because they have no mandate to abolish capitalism – to try to make it function as best as it may with inevitable disillusionment for the workers who have placed high hopes in Labour Government. “over a large part of Europe definitely Socialist administrations are actually in office, and the principles of Socialism are avowedly accepted as the basis of social and economic reconstruction.” (Preface to “Constitution for the Socialist Commonwealth of Great Britain.” Fabian Society 1920, p. v). What he meant was merely that there were Labour Governments in Germany and elsewhere and that the policy of State intervention in industry and in regulation of wages and hours of labour, etc., was on the increase. One lesson, not foreseen by Webb, is plain to see now. It was partly through disillusionment with efforts of Labour Parties to make capitalism function in the interests of the workers that millions of workers were driven to despair and lent a ready ear to the Fascist teaching of dictatorship and the totalitarian State. The certain inability of the British and other Labour Governments, separately or together, to eradicate the evils of capitalism will prove to some of their supporters that Labourism is not enough, though the immediate consequence of failure may be despair and bewilderment. Labour supporters – as can be seen from the election addresses and speeches of Labour candidates – largely fail to appreciate the nature of capitalism. They do not see that the evil results of capitalism are the necessary result of the private ownership of the means of production and distribution. They believe that a Labour Government can keep capitalism but remove its evil consequences. This is a belief that actual, bitter, experience will show to be an illusion. Capitalism must be abolished. Socialism is the only hope of the world working class.